Believe it or not, there is no language in current law that protects the rights of sportsmen to hunt and fish on U.S. Forest Service (USFS) or Bureau of Land Management (BLM) land — a fact that has not gone unnoticed by anti-hunting forces. 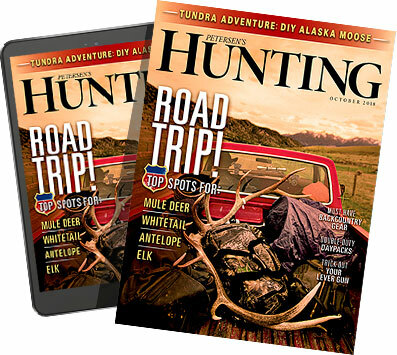 It has been a long-held assumption that hunting and fishing were allowed on public lands, but without specific legislation that guarantees that right, sportsmen may find themselves shut out of areas to which they have enjoyed access for years. House Bill 1825 — which is known as the Recreational Fishing and Hunting Heritage and Opportunities Act — was introduced by Rep. Dan Benishek, R-Mich., to guarantee the right to hunt and fish on BLM and USFS lands. The act essentially restricts the ability of state and local governments from taking away access to these areas. Benishek — a medical doctor and lifelong resident of Michigan's Upper Peninsula — is an avid outdoorsman who enjoys fishing, as well as hunting for grouse and whitetail deer around his home. He views this legislation as a critical step in protecting the rights of sportsmen for generations to come. "We have to ensure that our children and grandchildren are able to enjoy hunting and fishing on federal lands forever," Benishek said. In his home district, many hunters utilize public lands, which is why the bill seeks to insure hunters and anglers are not denied access to public lands across the country. "It's hard for me to think of something I enjoy more than heading out from my camp in the Ottawa National Forest in October and doing some bird hunting," Benishek says. Without legislation protecting the right to hunt and fish on public land, sportsmen are relying on long-held traditions to guarantee their right to access. Anti-hunting factions have tried to limit or eliminate hunting and fishing on public lands, and without specific language in place that guarantees access to sportsmen, our rights are in serious jeopardy. Section 2 of this 14-page bill recognizes hunters play a critical role in maintaining and financially supporting wildlife populations, stating hunting is "environmentally acceptable and beneficial." Additionally, the bill recognizes the fact that opportunities to hunt are declining, which is not good for wildlife. HR 1825 acknowledges "the public interest would be served, and our citizens' fish and wildlife resources benefitted, by actions to ensure that opportunities are facilitated to engage in fishing and hunting on Federal public land." Nelson Freeman, government affairs and hunter advocacy specialist for Safari Club International (SCI), applauded the bill. "The Recreational Fishing and Hunting Heritage and Opportunities Act will recognize the rightful place of recreational hunting, fishing, and shooting on federal lands," Freeman said. Both SCI and the NRA support HR 1825's efforts to guarantee the rights of sportsmen. Under HR 1825, public lands shall be "opened until closed" for hunting and angling. What does that mean? In short, the bill states that all public land should be open to sportsmen unless there is a legitimate reason why access should be denied, such as public safety concerns. If either the BLM or the USFS decides to close any portion of federal lands to sportsmen, they must file a report with the Natural Resources Committee outlining the reason for the closure and explaining why access to federal land should be denied. Essentially, the bill states that sportsmen have a right to hunt and fish on public land, and any agency that chooses to deny that right must justify their decision. State wildlife departments are typically charged with monitoring and managing wildlife populations, and hunting plays a vital role in this. Currently, the USFS and BLM have the right to close seasons arbitrarily despite the recommendations from state wildlife agencies. HR 1825 severely restricts the power of federal agencies to close state-approved hunting seasons. Benishek's bill guarantees access to federal lands for recreational shooters as well. Even though recreational shooters don't pay the license fees that hunters and fisherman pay, target shooting is still an enjoyable outdoor activity and — when done responsibly — poses no significant threat to the land or wildlife. There is very specific language throughout the bill that places recreational shooting under the umbrella of protection, meaning that target shooting is considered an acceptable activity on federal lands. Just because hunting is allowed doesn't mean that access is always guaranteed, but under HR 1825 federal lands would have to be accessible to sportsmen. Anti-hunting groups have often used limited access as a means to stop or restrict hunting and fishing activities, and HR 1825 insures that no agency shall prevent legal hunters and fishermen from accessing federal land without cause. HR 1825 may be voted on as early as next fall, Benishek believes. The bill is an essential piece of legislation for hunters, and it marks an important step toward protecting our rights now and for future generations of hunters. Sportsmen and women need to contact their representatives and urge them to vote for HR 1825. The bill is important because it takes a significant step toward preserving a right that many of us take for granted.